Showing items in category Solomon Islands, sorted by newest listed first. 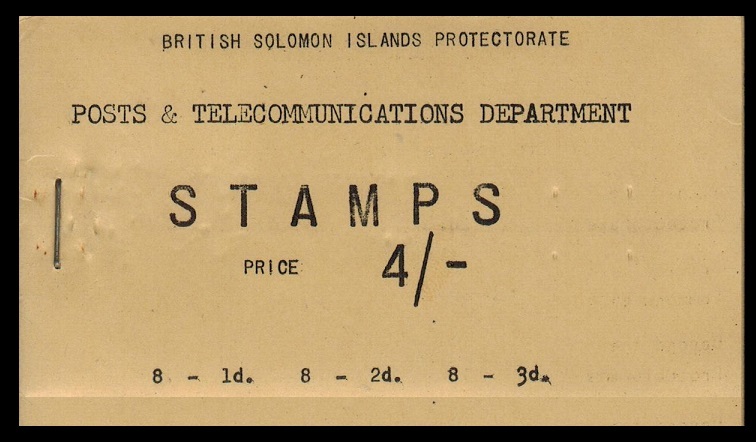 SOLOMON ISLANDS - 1944 'NZAPO 150/4' censor cover to New Zealand. 1944 use of stampless 'National Patriotic Fund Board/New Zealand' envelope addressed to New Zealand cancelled by violet N.Z.A.P.O.150/4 cancel (Gisburn type 42) used at Guadacanal and with violet triangular SERVICE CENSOR h/s at lower left. EGMONT VILLAGE arrival cds on reverse dated 4.MY.44. SOLOMON ISLANDS - 1988 22c 'Independence' U/M with variety WATERMARK INVERTED. SG 622w. 1988 22c 'Anniv of Independence' adhesive in a fine unmounted mint marginal example showing the variety WATERMARK INVERTED. SG 622w. SOLOMON ISLANDS - 1943 philatelic 'Printed Matter' 1/2d rate local cover cancelled LUNGA. 1943 (DE.8.) philatelic 'Printed Matter' 1/2d rate local cover cancelled LUNGA and sent uncensored. 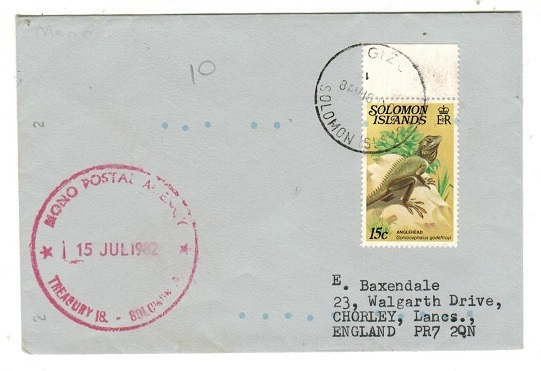 SOLOMON ISLANDS - 1975 'SEGHE POSTAL AGENCY' cover to UK. 1975 (MAR.4.) registered cover addressed to UK cancelled by crowned oval SEGHE POSTAL AGENCY/NEW GEORGIA IS cancel with 45c adhesive tied in transit at HONIARA. 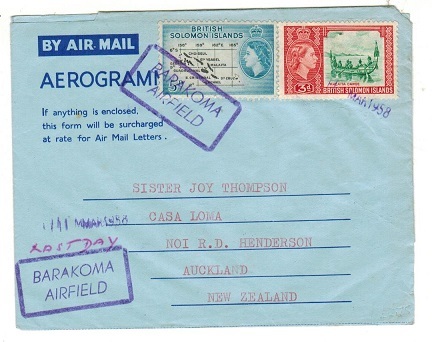 SOLOMON ISLANDS - 1976 'SAVO POSTAL AGENCY' cover to UK. 1976 (NOV.10.) 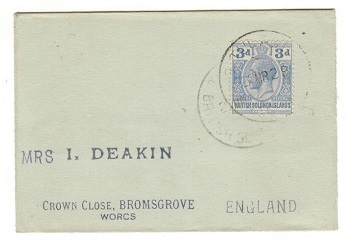 registered cover addressed to UK bearing 45c adhesive tied by large dark blue SAVO POSTAL AGENCY cds. 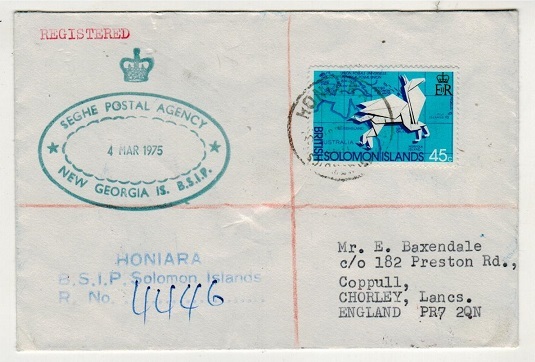 SOLOMON ISLANDS - 1978 'LIAPARI POSTAL AGENCY' cover to UK. 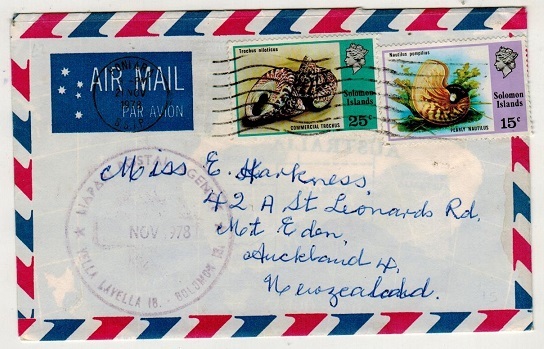 1978 (NOV. ) cover addressed to New Zealand bearing 15c and 25c tied by wavy line cancel and with violet LIAPARI POSTAL AGENCY/VELLA LAVELLA IS/SOLOMON IS cancel below. Proud type D2. 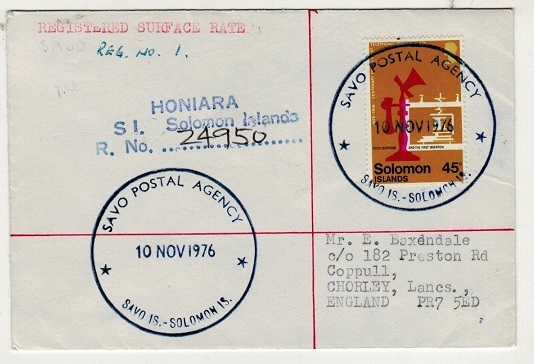 SOLOMON ISLANDS - 1982 'MONO POSTAL AGENCY' cover to UK. 1982 (15.JUL.) 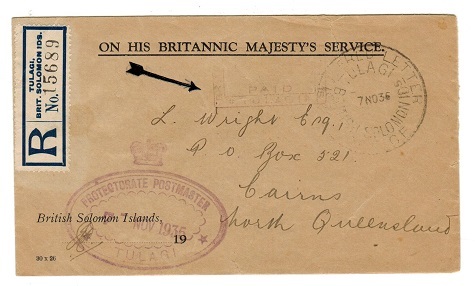 cover addressed to UK cancelled by large MONO POSTAL AGENCY/TREASURY ISLAND h/s in red with 20c adhesive tied GIZO on August 8th. 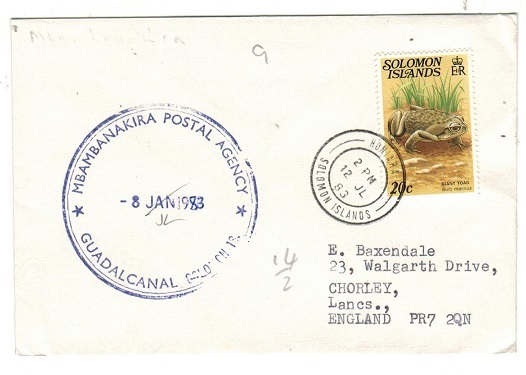 SOLOMON ISLANDS - 1983 'MBAMBANAKIRA AGENCY' cover to UK. 1983 (JL.12.) cover addressed to UK cancelled by large MBAMBANAKIRA POSTAL AGENCY/GUADALCANAL h/s in violet with 20c adhesive tied HONIARA 4 days later. SOLOMON ISLANDS - 1907 1/2d unofficial IMPERFORATE PLATE PROOF pair printed in ultramarine. 1907 1/2d unofficial IMPERFORATE PLATE PROOF (SG type 1) printed in the issued colour of ultramarine on thick ungummed card from the original die. SOLOMON ISLANDS - 1907 1d unofficial IMPERFORATE PLATE PROOF pair printed in rose-carmine. 1907 1d unofficial IMPERFORATE PLATE PROOF (SG type 1) printed in the issued colour of rose-carmineon thick ungummed card from the original die. SOLOMON ISLANDS - 1907 2d unofficial IMPERFORATE PLATE PROOF pair (fault) printed in indigo. 1907 2d unofficial IMPERFORATE PLATE PROOF (SG type 1) printed in the issued colour of indigo on thick ungummed card from the original die. Slight surface fault. SOLOMON ISLANDS - 1907 5d unofficial IMPERFORATE PLATE PROOF pair printed in emerald green. 1907 5d unofficial IMPERFORATE PLATE PROOF (SG type 1) printed in the issued colour of emerald green on thick ungummed card from the original die. SOLOMON ISLANDS - 1907 6d unofficial IMPERFORATE PLATE PROOF pair printed in chocolate. 1907 6d unofficial IMPERFORATE PLATE PROOF (SG type 1) printed in the issued colour of chocolate on thick ungummed card from the original die. SOLOMON ISLANDS - 1907 1/- unofficial IMPERFORATE PLATE PROOF pair printed in bright purple. 1907 1/- unofficial IMPERFORATE PLATE PROOF (SG type 1) printed in the issued colour of bright purple on thick ungummed card from the original die. SOLOMON ISLANDS - 1907 1d rose-carmine (SG 2) struck by RAROTONGA cds of the Cook Islands. 1907 1d rose-carmine 'large canoe' adhesive (SG 2) cancelled by near complete s/r RAROTONGA cds of the Cook Islands dated 15.MY.15. A very unusal use. SOLOMON ISLANDS - 1908 1d 'canoe' (SG 9) struck by large part 'S.S.KULAMBANGRA' maritime h/s. 1908 1d red 'small canoe' adhesive (SG 9) cancelled by large part of the violet straight lined 'S.S. KULAMBANGRA' ship handstamp. 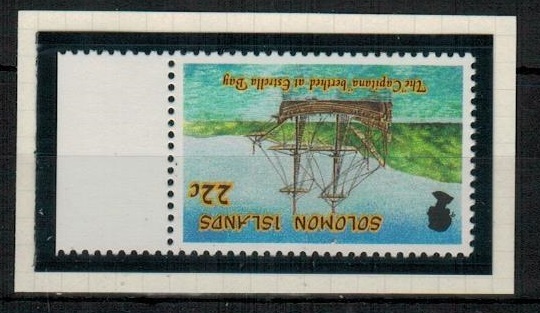 SOLOMON ISLANDS - 1908 2 1/2d 'canoe' tied to piece by PORT VILA cds of the New Hebrides. 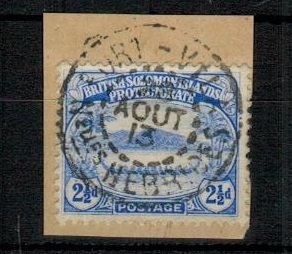 1908 2 1/2d ultramarine 'small canoe' adhesive (SG 11) tied to piece by PORT VILA/NELLES HEBRIDES cds dated 28.AOUT.13. A very unusual use. SOLOMON ISLANDS - 1910 (circa) French unused postcard of village life. 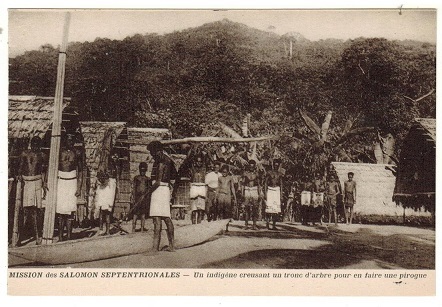 1910 (circa) unused French postcard depicting 'Mission Des Salomon Septentrionales-Un indigene creusant un tronc d'arbre pour en faire une pirogue'. SOLOMON ISLANDS - 1921 2 1/2d rate cover to USA used at TULAGI. 1921 (MY.19.) 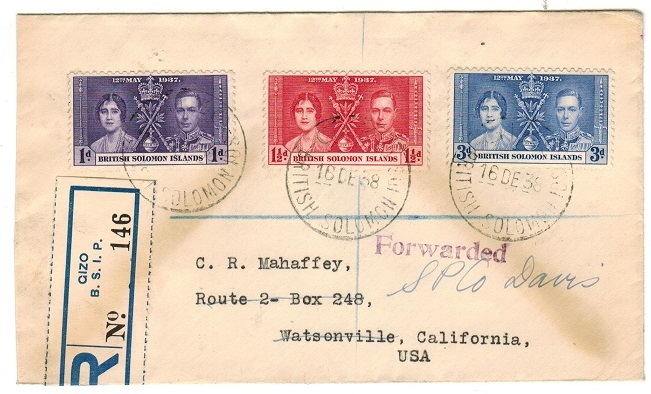 cover addressed to USA bearing 2 1/2d adhesive (SG 27) tied by TULAGI/BRITISH SOLOMON IDS cds. 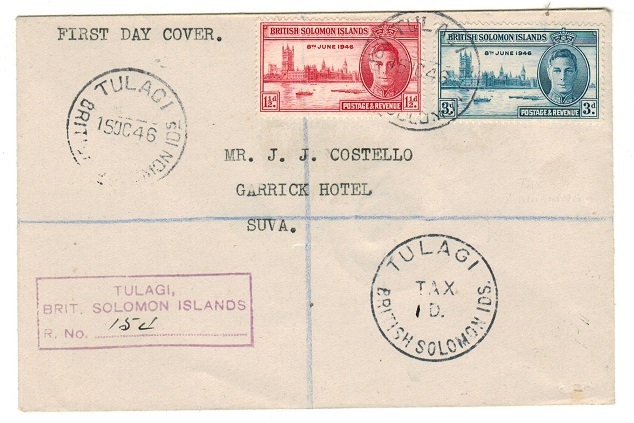 SOLOMON ISLANDS - 1929 3d rate cover to UK used at TULAGI. 1929 (MR.2.) 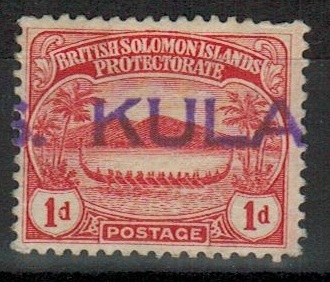 cover addressed to UK bearing 3d adhesive (SG 44) tied TULAGI/BRITISH SOLOMON IDS. SOLOMON ISLANDS - 1958 2d rate cover to New Guinea with A.V.CICELY maritime strike. 1958 (JA.25.) 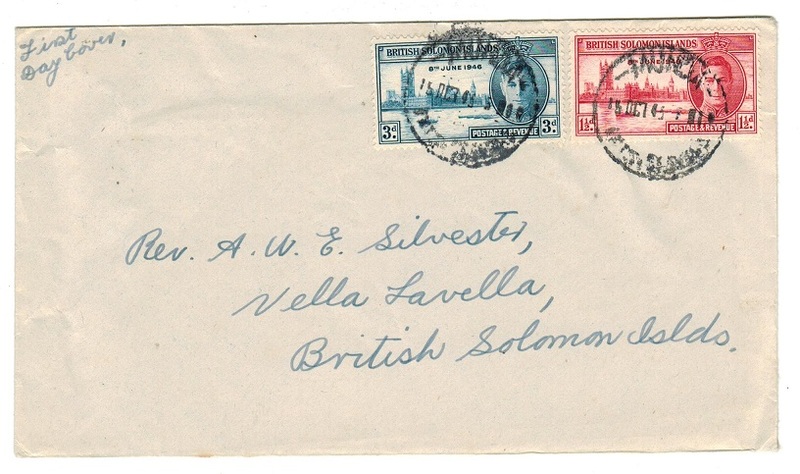 cover addressed to New Guinea (Rev Voyce) bearing QEII 3d Solomon Islands adhesive but cancelled BUIN/PAPUA NEW GUINEA with violet oval cogged A.V.CICELY II/ SOLOMON ISLANDS cachet at left. SOLOMON ISLANDS - 1958 FORMULA 'Aerogramme' to New Zealand with BARAKOMA/AIRFIELD strike. 1958 (MAR.11.) use of dark blue on blue FORMULA type AEROGRAMME addressed to New Zealand (no message) bearing 3d and 5d adhesives tied by violet boxed BARAKOMA/AIRFIELD handstamp. SOLOMON ISLANDS - 1907 1/2d ultramarine in a fine block of four with central TULAGI cds. SG 1. 1907 1/2d ultramarine in a fine block of four with central TULAGI cds lightly dated DE.2.09. A scarce multiple. SG 1. 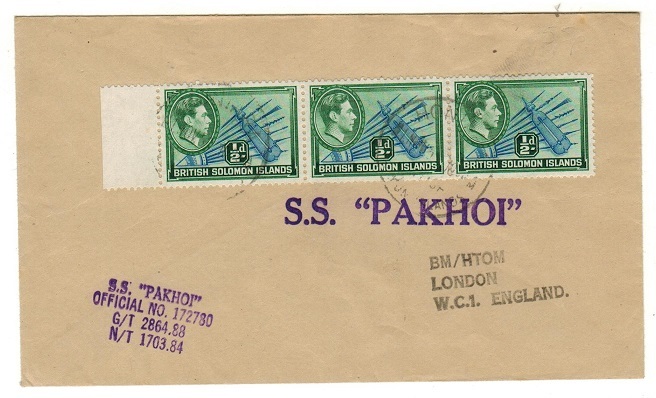 SOLOMON ISLANDS - 1953 'S.S.PAKHOI' maritime cover to UK. 1953 (NOV.1.) 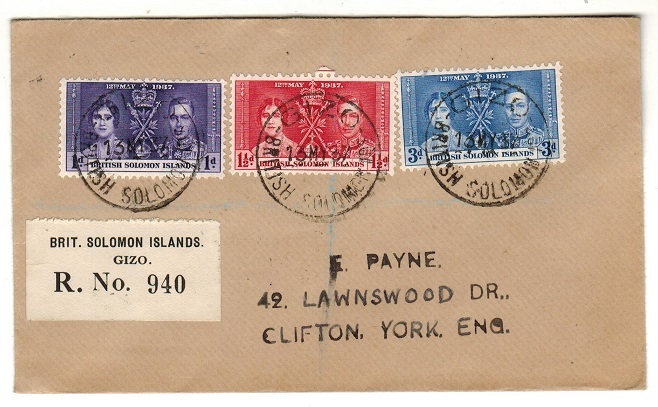 cover addressed to UK bearing 'KGVI' 1/2d strip of three tied by HONIARA cds with violet straight lined S.S.PAKHOI maritime strike below. SOLOMON ISLANDS - 1926 1 1/2d rate cover to USA used at GIZO. 1926 (MY.13.) 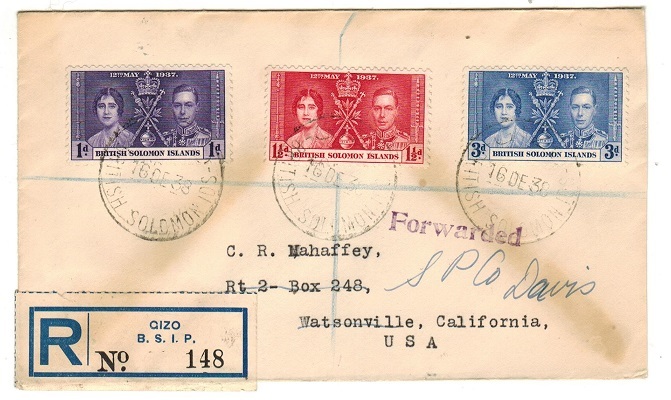 cover addressed to USA bearing 1/2d and 1d adhesives tied by GIZO/BRITISH SOLOMON IDS cds. 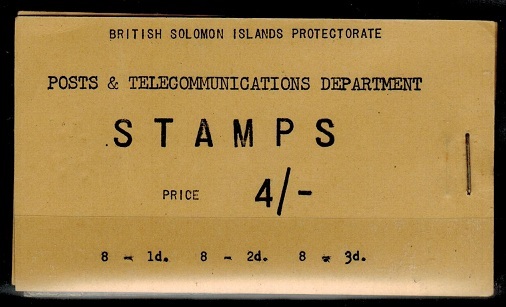 SOLOMON ISLANDS - 1928 1/- rate registered cover to UK. 1928 (MY.29.) 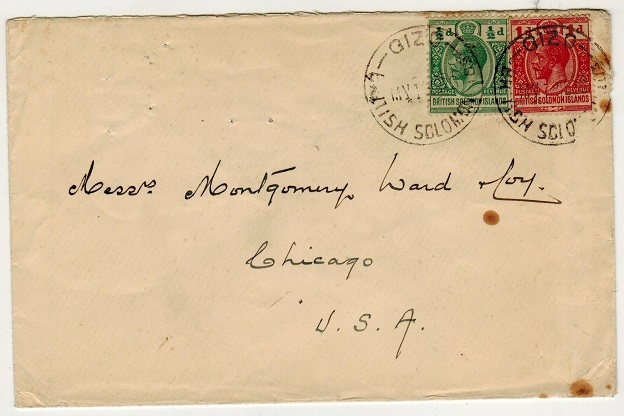 registered cover addressed to UK bearing the 1/- (SG 48) on emerald paper tied by scarce s/r REGISTERED/TULAGI/BRITISH SOLOMON IDS/OFFICE cancel (Proud type R1) with additional strike below. Scarce use to cancel adhesive. SOLOMON ISLANDS - 1934 1 1/2d rate cover to USA used at VANIKORO. 1934 (NO.28.) 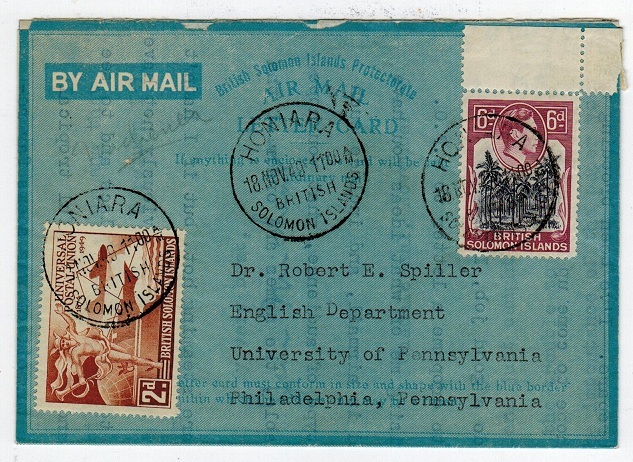 cover addressed to USA bearing 1 1/2d adhesive tied by VANIKORO/BRITISH SOLOMON IDS cds. 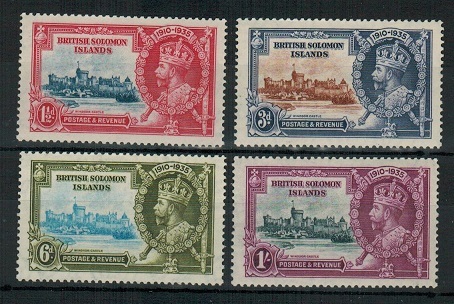 SOLOMON ISLANDS - 1935 'Silver Jubilee' set in PLATE/FRAME marginal singles. SG 53-56. 1935 'Silver Jubilee' series of four in unmounted mint condition showing frame PLATE 1 on 1 1/2d, 3d and 6d margins and frame Plate 4 on the 1/-. SG 53-56. 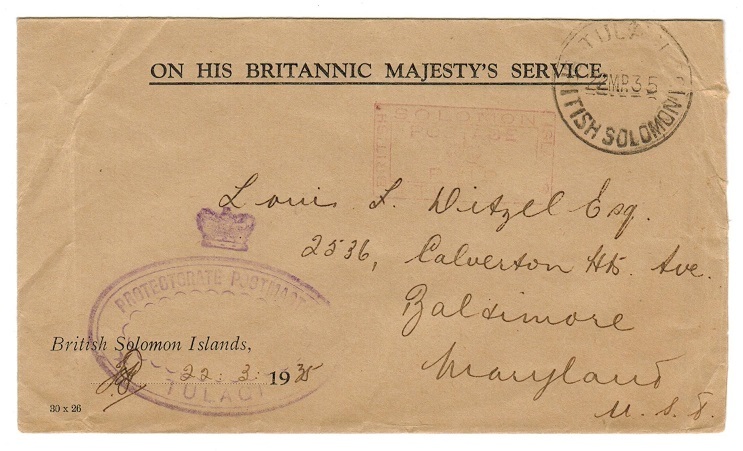 SOLOMON ISLANDS - 1938 registered 'Coronation' cover to USA used at GIZO. 1938 (DE.16.) registered cover to USA bearing the 'Coronation' trio tied by GIZO cds's and with blue on cream R/GIZO/B.S.I.P. registered label below. SOLOMON ISLANDS - 1960 £1 black on orange BOOKLET. SG SB4. 1960 £1 black on orange BOOKLET stapled at left. SG SB4. SOLOMON ISLANDS - 1960 5/- black on green BOOKLET. SG SB3. 1960 5/- black on green BOOKLET stapled at left. SG SB3. SOLOMON ISLANDS - 1959 11/- black on grey BOOKLET. SG SB2. 1959 11/- black on grey BOOKLET stapled at left. SG SB2. SOLOMON ISLANDS - 1959 4/- black on buff BOOKLET. SG SB1. 1959 4/- black on buff BOOKLET stapled at left. SG SB1. SOLOMON ISLANDS - 1907 6d IMPERFORATE PLATE PROOF printed in chocolate. 1907 6d IMPERFORATE PLATE PROOF marginal example of the 'large canoe' issue (SG type 1) printed in the issued colour of chocolate on thin ungummed cream card. 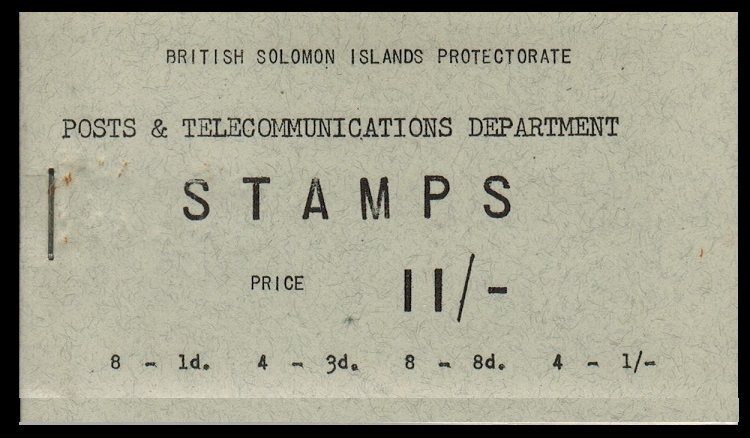 SOLOMON ISLANDS - 1946 'TULAGI/TAX 1d' strike on registered 'Victory' cover to Fiji. 1946 (OC.15.) 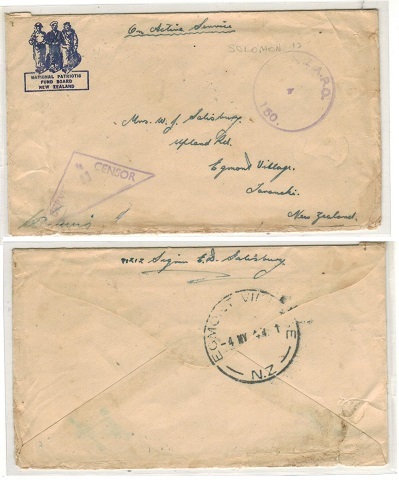 registered cover addressed to Fiji bearing the 'Victory' pair (SG 73+74) tied by TULAGI first day cancel but being underpaid having scarce TULAGI/TAX 1d/BRITISH SOLOMON IDS cancel applied below. 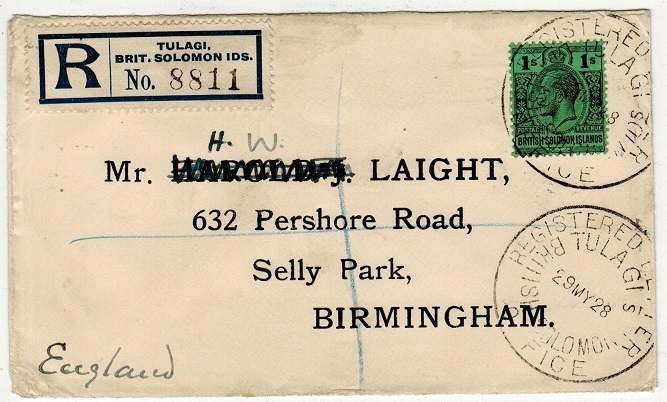 SOLOMON ISLANDS - 1944 2/- adhesive on local cover used at LUNGA. 1944 (NO.22.) 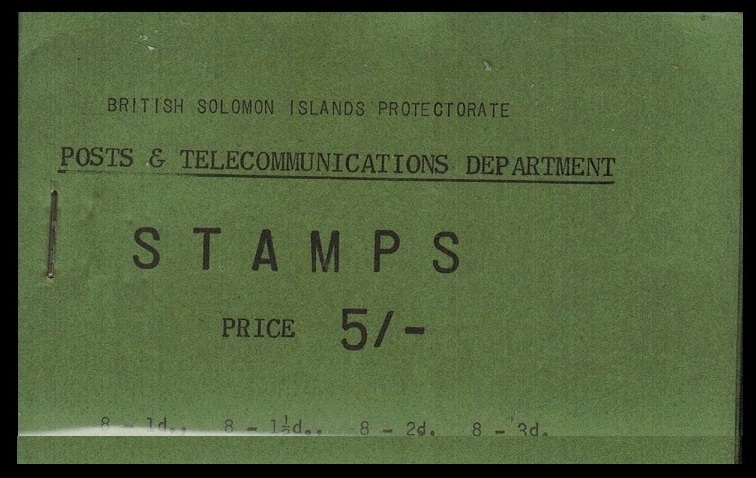 cover addressed locally to Malaita Island bearing the 'KGVI' 2/- (SG 69) tied by LUNGA/BRITISH SOLOMON IDS cds. 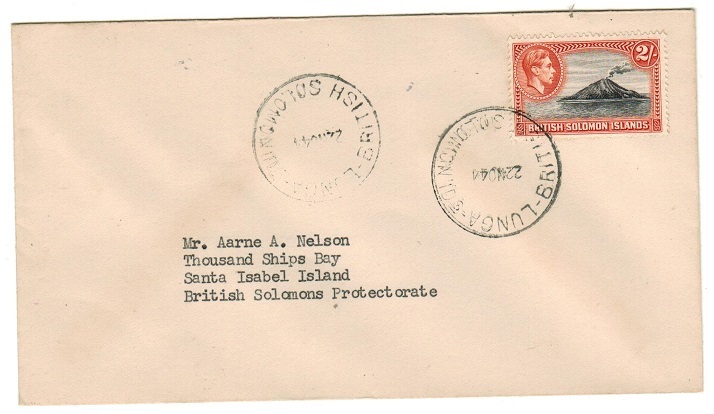 SOLOMON ISLANDS - 1937 registered 'Coronation' fdc using the rare GIZO 'temporary' label. 1937 'Coronation' registered first day cover addressed to UK bearing the trio (SG 57-59) tied by GIZO/BRITISH SOLOMON IDS cds's with rare black on white perforated BRIT.SOLOMON ISLANDS/GIZO/R.No registered 'temporary' label at lower left. SOLOMON ISLANDS - 1943 (circa) Japanese censored military p'card used at New Georgia Solomon Is. 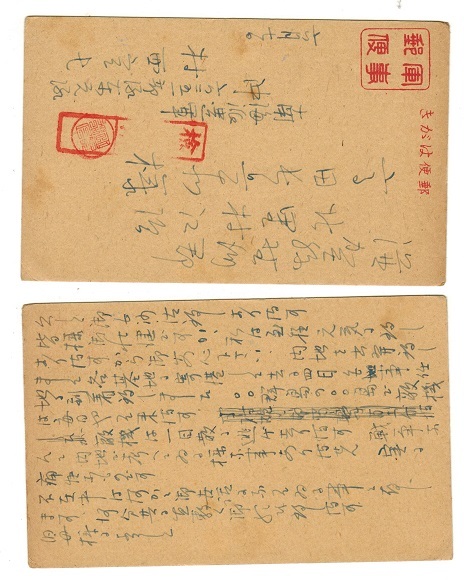 1943 (circa) Japanese Military postcard addressed to Shinga in Japan with return address being noted as 'South Sea Dispatch Force Oki 62 - 6251 Unit' which was located at New Georgia in central Solomon Islands. Red boxed censor chop applied. 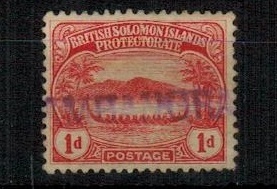 A scarce use in the Solomon Islands. SOLOMON ISLANDS - 1950 (circa) blue on buff FORMULA registered stationery envelope unused. 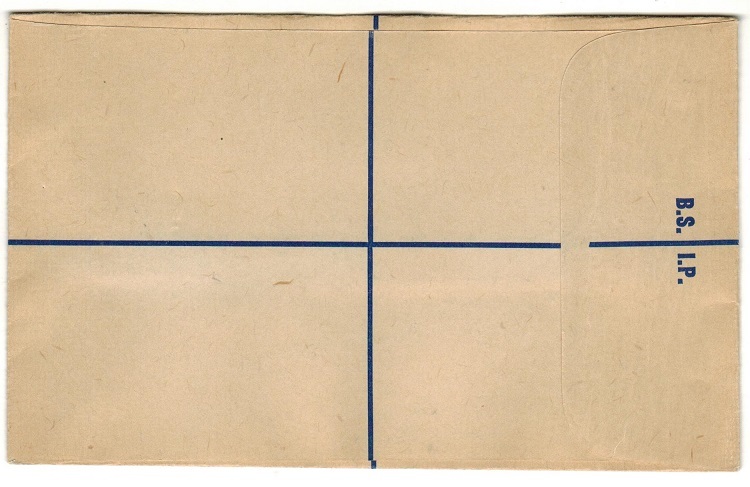 1950 (circa) blue on buff FORMULA registered postal stationery envelope (size G) in unused condition with 'B.S.I.P.' printed on flap. 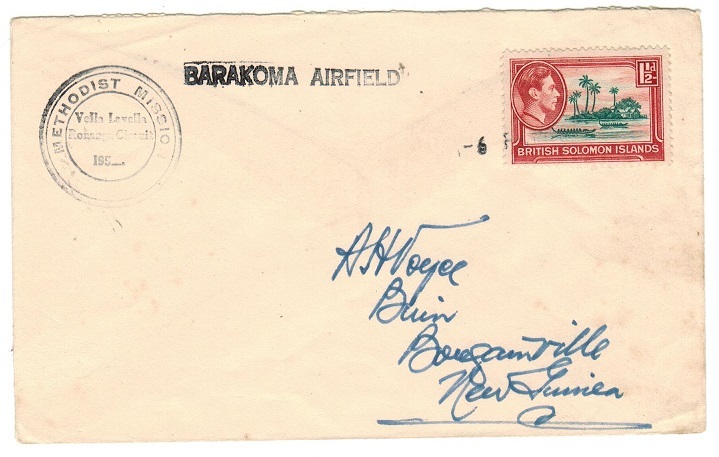 SOLOMON ISLANDS - 1950's BARAKOMA AIRFIELD cover to New Guinea. 1950's cover addressed to New Guinea (A.H.Voyce) bearing 'KGVI' 1 1/2d adhesive tied by weak black s/l date handstamp with BARAKOMA AIRFIELD strike at left. Ex Methodist Mission cover. 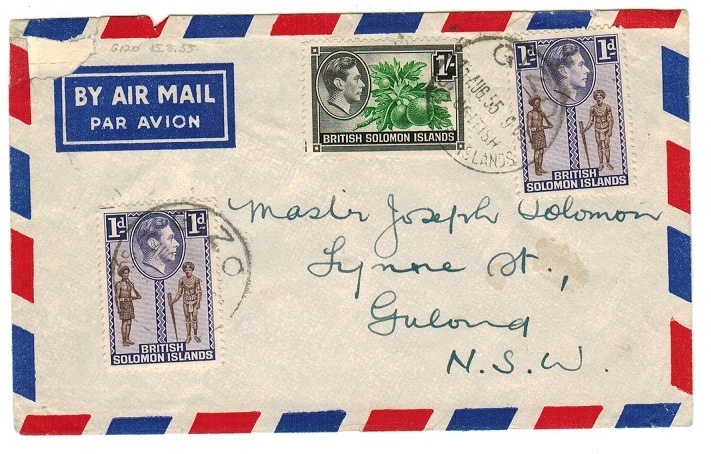 SOLOMON ISLANDS - 1955 cover to Australia used at GIZO. 1955 (AU.15.) 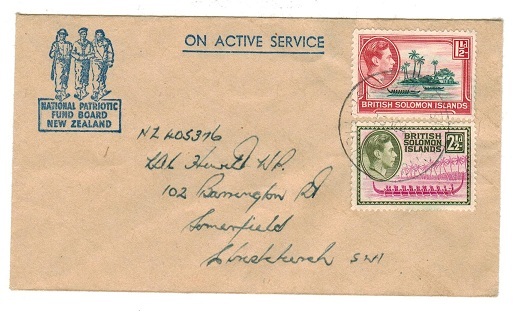 cover addressed to Australia bearing 'KGVI' 1d (x2) and 1/- adhesives tied by GIZO/BRITISH/SOLOMON ISLANDS cds's. SOLOMON ISLANDS - 1944 PASSED BY CENSOR 2 cover to USA at 3d rate from LUNGA. 1944 (JY.12.) 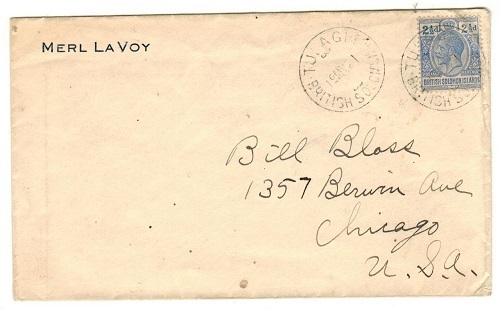 cover addressed to USA bearing 'GV' 3d blue adhesive tied by LUNGA/BRITISH SOLOMON IDS cds with black PASSED BY CENSOR 2 rubber h/s at left. 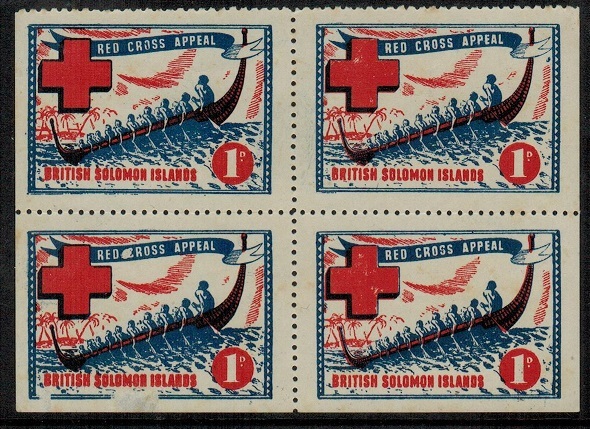 SOLOMON ISLANDS - 1941 RED CROSS APPEAL patriotic label in a unused block of four. 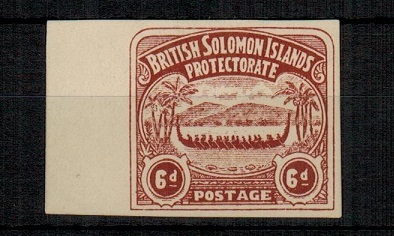 1941 (circa) 1d red, white and blue RED CROSS APPEAL/BRITISH SOLOMON ISLANDS patriotic label in a fine unused block of four. Perforated but with three imperforate edges. One stamp with small surface fault. A scarce multiple. 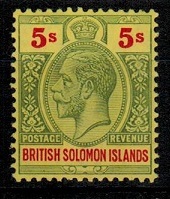 SOLOMON ISLANDS - 1914 5/- green and red on yellow mint. SG 36. 1914 5/- green and red on yellow in fine unmounted mint condition. SG 36. SOLOMON ISLANDS - 1935 Silver Jubilee set U/M. SG 53-56. 1935 'Silver Jubilee' set of four in fine unmounted mint condition. SG 53-56. 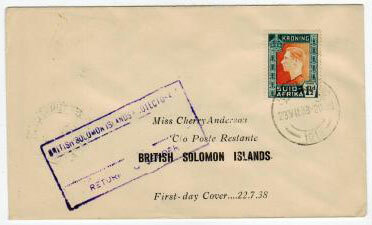 SOLOMON ISLANDS - 1947 registered cover to UK with 'Victory' adhesives tied AUKI in violet. 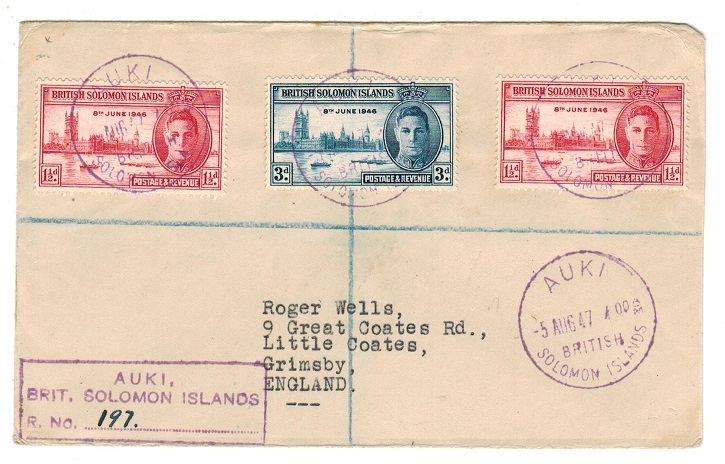 1947 (AUG.5) reg'd (Wells) cover to UK bearing 'Victory' 1 1/2d pair & 3d each tied by individual AUKI/BRITISH/SOLOMON ISLANDS cds's struck in magenta. Boxed AUKI/ BRIT SOLOMON ISLANDS/R.NO... h/s at lower left. SOLOMON ISLANDS - 1946 'Victory' pair on local FDC cover used at MUNDA. 1946 (OCT.15.) locally addressed FDC bearing 'Victory' pair (SG 73+74) tied by MUNDA/BRITISH SOLOMON IS cds. SOLOMON ISLANDS - 1943 US 6c PSC used at APO/717 by US troops at Munda. 1943 (DEC.3.) 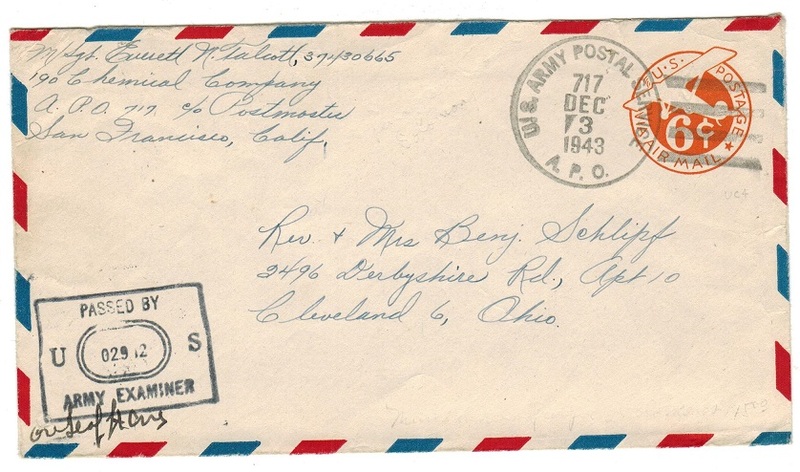 use of 6c orange US postal stationery envelope addressed to USA cancelled by US.ARMY POSTAL SERVICE/APO 717 cds with black boxed PASSED BY/US 02912/ARMY EXAMINER h/s at left. Sent by a member of the 190th chemical company stationed at Munda in New Georgia in the Solomon Islands. Used during the short period of re-occupation. 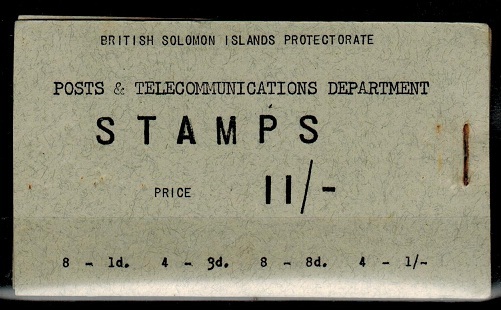 SOLOMON ISLANDS - 1939 1d rate cover to Australia used at TULAGI. 1939 (NO.21.) cover addressed to Australia (vertical and horizontal folds iron out) bearing 1 1/2d adhesive tied by TULAGI/BRITISH SOLOMON ISLANDS cds. Used just after the outbreak of the 2nd World war but uncensored. 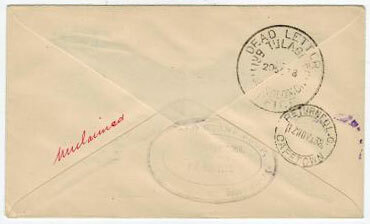 SOLOMON ISLANDS - 1938 multi franked registered cover to USA used at TULAGI. 1938 (JY.7.) 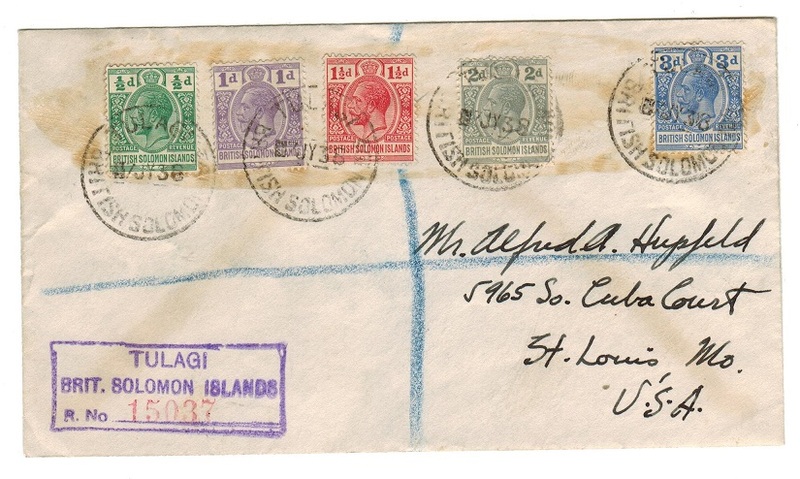 registered cover addressed to USA bearing 'GV' 1/2d to 3d adhesives (SG 39,41,42,43+44) tied by TULAGI/BRITISH SOLOMON IDS cds's ( some glue marking around stamps) with violet boxed TULAGI/BRIT.SOLOMN ISLANDS/R.NO…. h/s below. 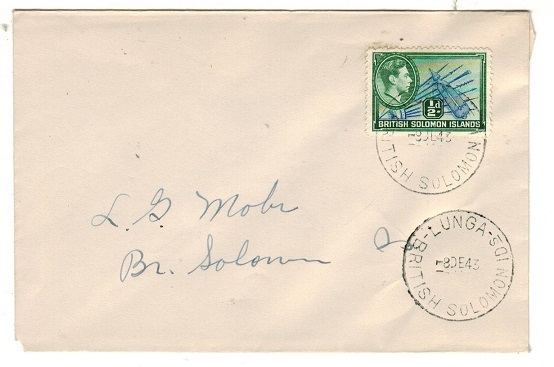 SOLOMON ISLANDS - 1936 registered POSTAGE PAID 'OHMS' cover to Australia. 1936 (NO.7.) small sixed OHBMS envelope registered to Queensland cancelled by large REGISTERED LETTER/TULAGI cancel with light red boxed POSTAGE PAID h/s applied and with crested oval PROTECTORATE POSTMASTER/TULAGI h/s applied at lower left. SOLOMON ISLANDS - 1967 use of the 'Coronation' trio by PAQUEBOT to USA. 1967 (AUG.2.) 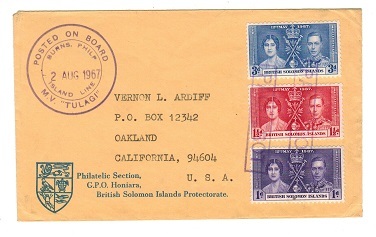 'Br.Solomon Islands, Philatelic Section' cover addressed to USA bearing the 1937 Coronation trio tied by violet boxed PAQUEBOT h/s's with ringed POSTED ON BOARD/M.V.TULAGI h/s at left. 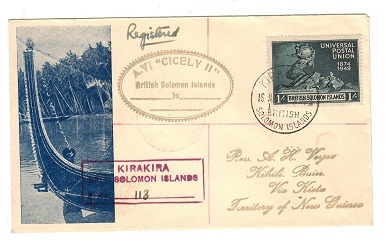 SOLOMON ISLANDS - 1956 A.V.CICELY II maritime illustrated cover from KIRAKIRA to new Guinea. 1956 (JUL.16.) illustrated registered cover addressed to New Guinea bearing the 1/- (SG 80_ UPU adhesive tied by KIRAKIRA with red boxed KIRAKIRA registered handstamp below and struck by oval A.V.CICELY II maritime h/s. (Gisburn type 33). SOLOMON ISLANDS - 1917 TULAGI PAID violet h/s OHMS cover to Australia. 1917 (NOV.30.) long black on blue O.H.M.S. 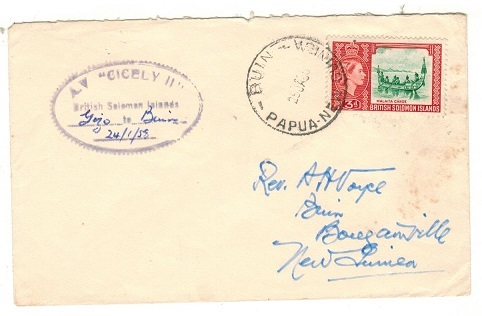 (British Solomon Islands Protectorate) envelope addressed to Australia (opened on two sides) and cancelled by violet boxed BRITISH SOLOMON ISLANDS TULAGI/PAID handstamp with TULAGI cds alongside. Large crested BRITISH SOLOMON ISLANDS/H.M.CUSTOMS strike on reverse. 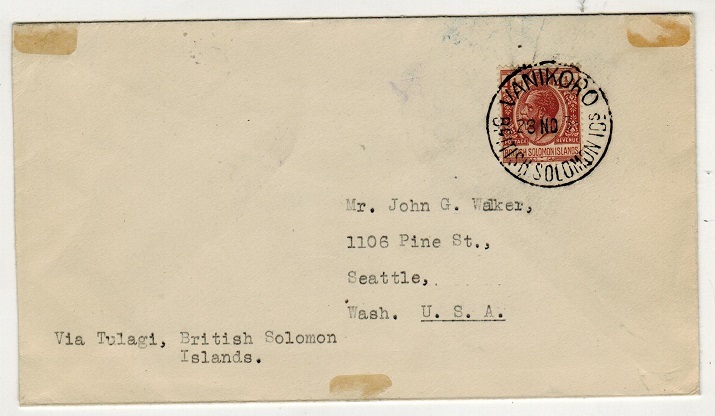 SOLOMON ISLANDS - 1935 registered OHMS to USA with POSTAGE PAID h/s in red. 1935 (MR.22.) use of small sized OHMS envelope registered to USA and cancelled by TULAGI/ BRITISH SOLOMON IDS cds. 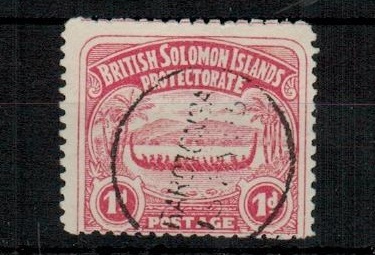 Struck by violet crowned oval PROTECTORATE POSTMASTER h/s and with scarce red boxed POSTAGE PAID/BRITISH SOLOMON ISLANDS strike. 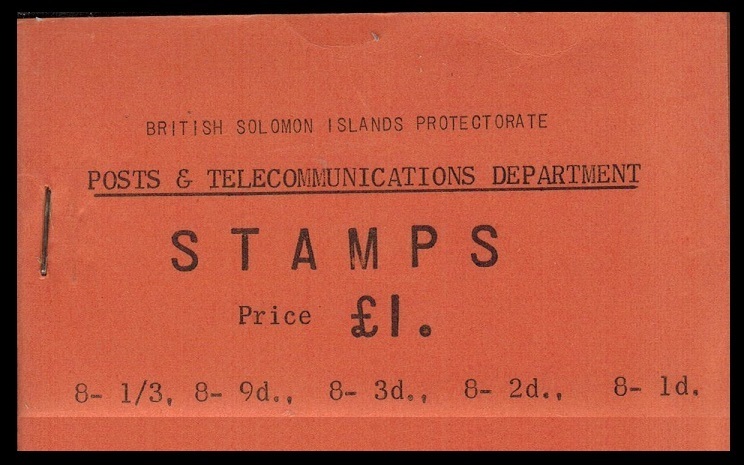 SOLOMON ISLANDS - 1908 1d red (SG 9) cancelled by part S.S.KULAMBANGRA maritime h/s. 1908 1d red (SG 9) cancelled by part S.S.KULAMBANGRA straight lined maritime handstamp in violet showing 'S.KULA' . 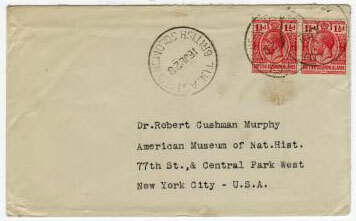 SOLOMON ISLANDS - 1949 use of FORMULA uprated letter card to USA. Rare genuine use. 1949 (NOV.18.) 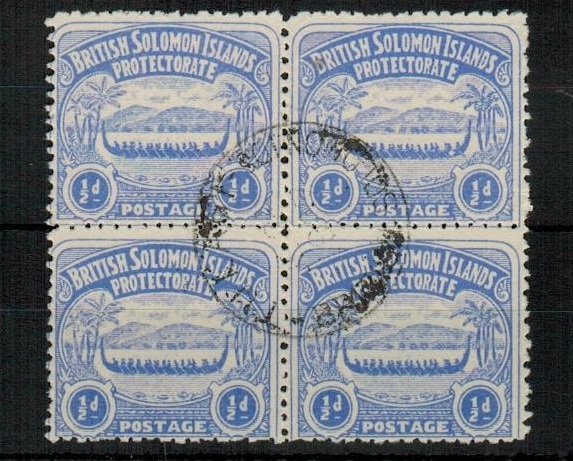 use of blue on cream FORMULA BRITISH SOLOMON ISLANDS/AIR MAIL/ LETTER CARD addressed to USA and bearing 6d pictorial and 2d 'UPU' adhesive tied by HONIARA/ BRITISH/SOLOMON ISLANDS cds. A genuine use of this stationery with long internal message. A very rare piece of stationery so used. SOLOMON ISLANDS - 1956 11/- Black on grey complete BOOKLET. SG SB2. 1956 11/- Black on grey complete BOOKLET stapled at right. SG SB2. SOLOMON ISLANDS - 1956 4/- black on yellow complete BOOKLET. SG SB1. 1956 4/- black on yellow-buff complete BOOKLET stapled at right. SG SB1. SOLOMON ISLANDS - 1935 6d 'Silver Jubilee' blk x4 mint of FRAME PLATE 1. SG 55. 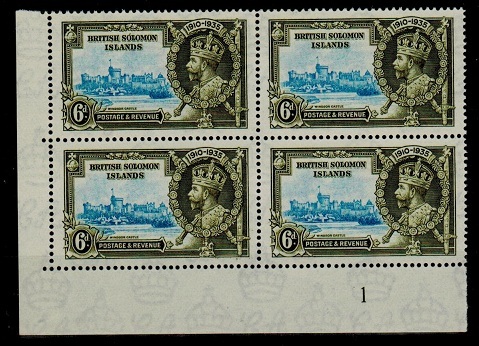 1935 6d light blue & olive green 'Silver Jubilee' adhesive in a fine mint FRAME PLATE 1 block of four. SG55. SOLOMON ISLANDS - 1908 2d (SG 10) cancelled by part KULAMBANGRA maritime strike. 1908-11 2 d grey cancelled by large part of the violet KULAMBANGRA straight line maritime vessel handstamp showing 'KULAMB'. Scarce. SG 12. 1943 (OC.15.) 'National Patriotic Fund Board New Zealand' ON ACTIVE SERVICE envelope addressed to a serving soldier at Christchurch bearing 1 1/2d and 2 1/2d adhesives tied LUNGA/ BRITISH SOLOMON ISLANDS. SOLOMON ISLANDS - 1947 light blue on blue FORMULA type LETTER CARD unused. H&G 1. 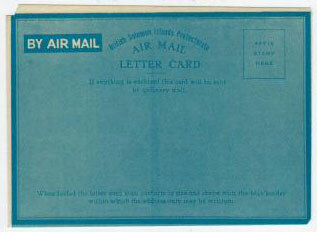 1947 'KGVI' Light blue on blue diagonal overlay on white FORMULA air letter sheet (curved inscription) in fine unused condition. Very scarce unused. H&G1. 1938 (23.VII.) 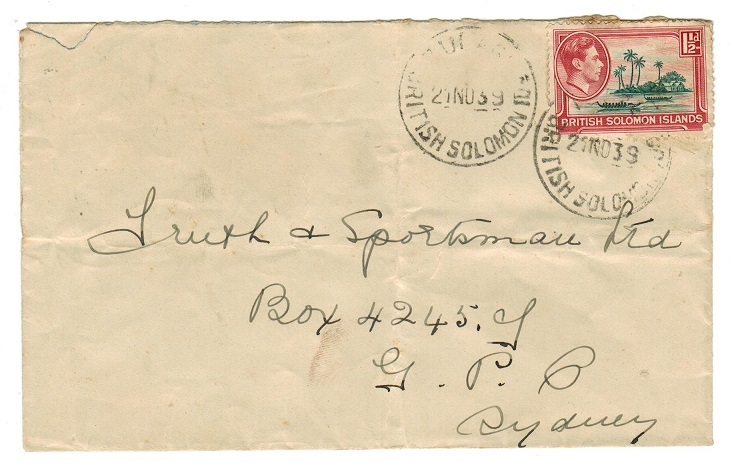 inward cover from South Africa marked 'First Day Cover' bearing 1 1/2d adhesive tied JOHANNESBURG/101 but undelivered and with DEAD LETTER TULAGI b/s dated 20.SE.38 alongside manuscript 'UNCLAIMED' in red ink. The front struck by scarcer boxed BRITISH SOLOMON PROTECTORATE/………./RETURN TO SENDER h/s applied in violet and RETURNED L.O./ CAPETOWN b/s. 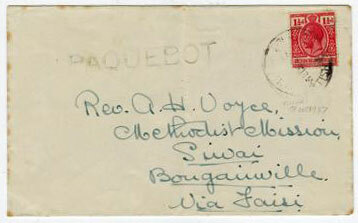 SOLOMON ISLANDS - 1937 maritime PAQUEBOT cover from TULAGi to New Guinea. 1937 (DEC.18) cover to New Guinea (centre fold) bearing 1 1/2d (SG42) tied by weak TULAGI cds with fine straight lined PAQUEBOT h/s in black alongside. SOLOMON ISLANDS - 1928 3d rated cover from TULAGI. 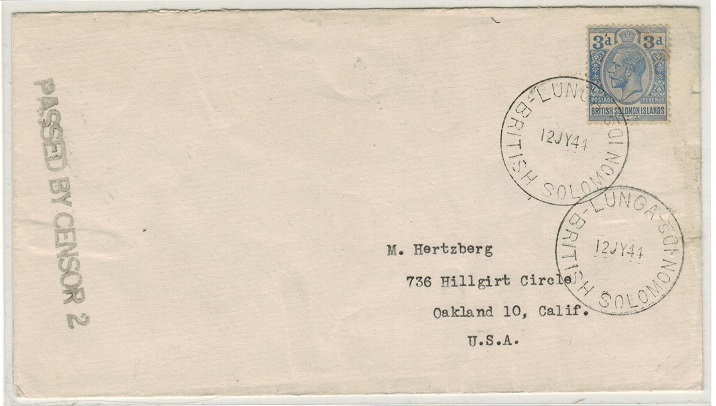 1928 (JL.16) cover to USA bearing 1 1/2d pair tied TULAGI/BRITISH SOLOMON IDS cds's.